This painting is about the concept of knowledge versus wisdom. That knowledge becomes practical wisdom only with experience. It is also about how the wisdom we gain in our lives is one of the few possessions we carry with us to the end, and the gift of most value that we pass onto future generations. The kingfisher bird pulling the apple tree always carries its source of shelter and food. Such is wisdom. Once gained it is never lost. 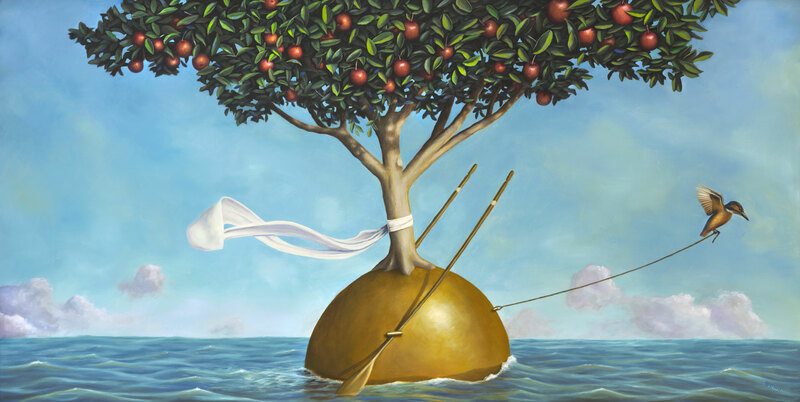 The apple tree traditionally symbolizes knowledge. But here, its strenuous passage across the sea represents the journey of experience, by which that knowledge transforms into wisdom.